Jewish family in Alzey, Rhein-Hessen. It traces its origin to Isaac Simon, who at the end of the eighteenth century took the family name of Belmont. 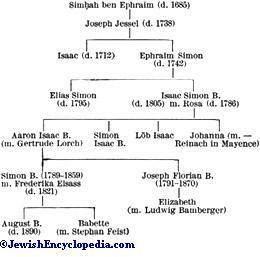 His father, Ephraim Simon (d. 1742), was the son of Joseph Jessel, "Vorsteher der Juden in Ampt Alzey" (d. 1738), who is probably the person mentioned in a document dated 1700 (Löwenstein, "Juden in der Kurpfalz," p. 146). This Jessel was the son of Simḥah ben Ephraim (d. 1685), who was buried in Sobernheim. The son of Isaac Simon mentioned above was Simon Belmont, who died March 16, 1805. Of his four children, the eldest, Aaron Isaac (m. Gertrude Lorch of Frankfort), was the great-grandfather of August Belmont. Johanna, a sister of Aaron Isaac, married a Mr. Reinach of Mayence; and Joseph Florian, the younger brother of Simon, had a daughter who married Ludwig Bamberger. August Belmont had a second cousin, Charles Frederick, who remained in Alzey. Of the issue of the latter, some live in Alzey, some in Frankfort-on-the-Main, and others in Philadelphia. Simon had a daughter, Babette, who married Stephan Feist of Frankfort, from whom the Feist-Belmonts are descended. 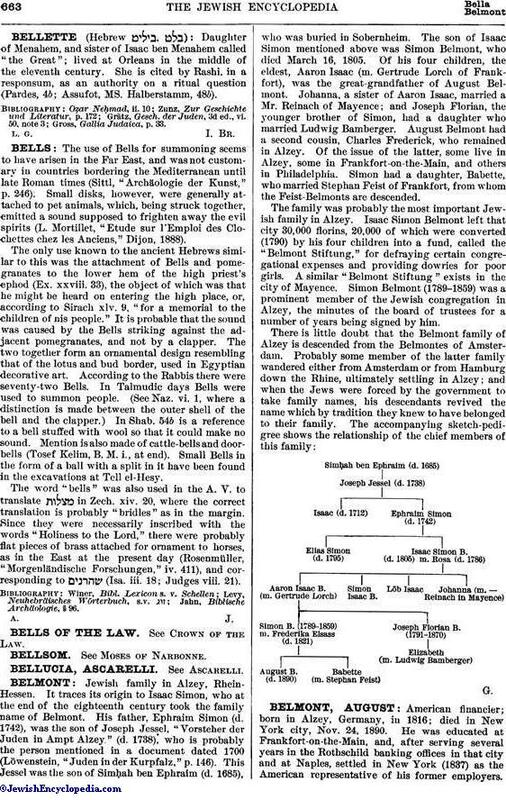 The family was probably the most important Jewish family in Alzey. Isaac Simon Belmont left that city 30,000 florins, 20,000 of which were converted (1790) by his four children into a fund, called the "Belmont Stiftung," for defraying certain congregational expenses and providing dowries for poor girls. A similar "Belmont Stiftung" exists in the city of Mayence. Simon Belmont (1789-1859) was a prominent member of the Jewish congregation in Alzey, the minutes of the board of trustees for a number of years being signed by him.